Thousands of Online Poker Tournaments in progress at any time. All the top Championships such as the World Series of Poker are in Tournament format. Poker Tournaments are an extremely popular way of playing poker and at any moment there are thousands of online poker Tournaments in progress and if you look at any casino poker room they will have a schedule of poker Tournaments that regularly take place. Poker can be played in one of two main formats. The first is the standard cash game format where a player sits down at a table with an amount of money. The players at these tables are playing for real money and any money they win or lose here will directly impact the balance of their bankroll. The second is poker Tournaments where each player pays a buy in amount at the start of the Tournament and in return receives an amount of Tournament chips to play with. All the player’s buy ins are combined to form the Tournament prize pool which is then awarded to the top finishing players in the Tournament. Poker players love Tournaments because it is possible to win a large prize compared to the relatively small portion of money risked with the buy in. For example you may buy in to a Tournament for $10 and if you finish the Tournament in a high position then you may take home many thousands of dollars in return. These Tournaments can take a number of hours to complete, and generally the higher the number of entrants to a Tournament the longer it will take to complete. Similarly the higher the number of entrants the higher the prize pool will be. Tournaments are also popular because they can be very strategic, and it is possible to develop strategies that give you a better chance of progressing far in a Tournament and give you what is called an “edge” in poker. This is why you see many good Tournament poker players consistently getting good results and being very profitable. Tournaments are available for all the different poker games, and can be played from the lowest stakes of a dollar or two all the way up to high stakes entry Tournaments of many thousands of dollars. Poker Tournaments will also be found for all different betting limits such as No Limit, Fixed Limit or Pot Limit formats. For more detail on limits and how this affects the betting rules please read our guide to Poker Stakes & Betting Limits. So… How do you play a Poker Tournament? We are not going to cover here the rules of the individual poker game (such as Texas Holdem) that the Tournament is based on. To learn the rules for the individual game you are playing then select the step by step guide for that game type from our Poker Games and Rules section. Instead we are going to focus on the structure of a poker Tournament and the stages involved to get you started playing in a Tournament. To enter a Poker Tournament you must pay a fixed buy in amount. In exchange for paying your buy in you will be given an amount of Tournament chips to play the Tournament with. If you lose all of those chips then you are eliminated from the Tournament. The winner will be the last player standing who holds all the chips. During the course of the Tournament the blinds and minimum bets will increase according to the structure of the Tournament. What this means is that you must continually increase your stack of chips by winning pots in order to be able to afford the increasing cost of the blinds and minimum bets. Standard Freezeout Tournament – . Each player pays a fixed buy in, once a player loses all their Tournament Chips then they are eliminated from the Tournament (they are “frozen out”). Prize money will be awarded to the top finishing players usually the top 10% of entrants but it will vary. Rebuy Tournaments – Players are given the opportunity to rebuy into the Tournament when they lose all their Tournament Chips. This is limited to a set period, usually the first hour. When a player rebuys then they will be given a new starting stack of chips. These types of Tournament usually lead to a much higher prize pool as players are contributing multiple buy ins. Satellite Tournaments – the prize in a Satellite Tournament is entry to a higher buy in Tournament. These are often run for the big online poker tournaments and also offline tournaments held in casinos. They are a great way to win an entry into a higher buy in event that otherwise would be outside of your bankroll limits. Shootout Tournaments – in a standard Tournament players are moved to different tables during the course of the tournament to rebalance tables as players are eliminated. A Shootout tournament is different in that each table will play until there is only 1 player left. Once each table has only 1 player left then all players advance to be reseated at new tables and the same will happen again playing until only 1 player is left. This continues until the final table is reached. Heads Up Tournaments – Players play in heads up mode which is where two players play 1 v 1. The winner of each match will advance to the next heads up match and this will repeat until there are just 2 players left at the final table. Deep Stack Tournaments – players start with a larger starting stack of Tournament Chips. This allows more play time and can lead to more strategic play but naturally increases the length of the Tournament. 6 Max or Shorthanded Tournaments – these tournaments are played with a reduced number of players at each table usually 6 players (6 Max) or sometimes 4 players (4 Max). Playing in shorthanded tables requires a different strategy as you are playing against less hands, and the blinds will rotate around the table much quicker. The first stage is fairly straight forward, we need to decide on what type of Tournament we want to play and then go and find an online Tournament that is starting soon. What stakes / buy in do you want to play? The first two you will probably already have a pretty good idea of what you want to play. The most commonly played Poker Tournament is Texas Holdem No Limit so you will find lots of Tournaments available for that. For less popular games, or limit formats you may find a lot less Tournaments available and may need to be prepared to wait longer for a Tournament to be available as there will be less Tournaments scheduled and less players wanting to play in those Tournaments. When deciding the stakes that you want to play at then you need to consider what we call Bankroll Management. Poker involves an element of risk and you need to ensure that you have enough buy ins included in your bankroll to recover from the times when you don’t win any money. Lets assume the worst and say you have a really bad run in poker Tournaments, you enter multiple Tournaments and get knocked out each time without winning any prize money. You need to ensure that you still have further buy ins available in your bankroll so that you can continue to buy into further Tournaments so that eventually when you do win some prize money your bankroll and previous losses can be replenished. The total money you have available in your poker bankroll will determine what stakes Tournaments you can responsibly play at following proper bankroll management principles. We recommend you take a look at our Introduction to Poker Bankroll Management guide to further understand this important poker principle. Once you have decided on what type, limit and stakes Poker Tournament you want to play in then its time to find a suitable Tournament. If you haven’t yet chosen an online poker site to play Tournament poker then see our Play Poker section where we can recommend to you an online poker site that is trusted and also offers regular Poker Tournaments. 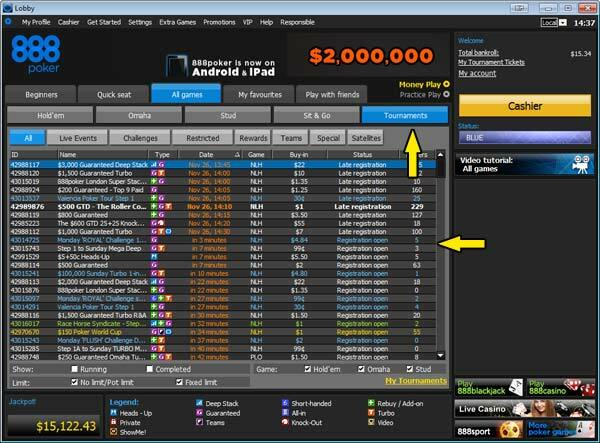 Load up your chosen online poker site’s software and select the Tournaments tab where you will find a list of all available Tournaments that are scheduled. Depending on your chosen software you may be able to filter the list to show only the types of Tournaments you are looking for. Look down the list and find a suitable Tournament that is starting fairly soon. Double click on it to bring up the “Tournament lobby” window. Now that we have selected a Tournament and have the Tournament lobby window up we need to check the details and confirm that we want to enter the Tournament by paying the buy in. 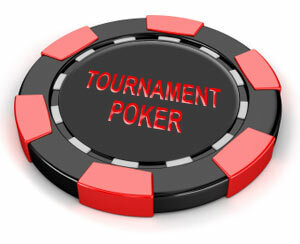 The Buy in for a Tournament will usually be described with two numbers such as $1.00 + $0.25. The larger number is the Tournament buy in which goes into the Tournament’s prize pool. The smaller number is the fee that the online poker site charges for you to enter the Tournament and is usually a small % of the buy in. The total cost to enter the Tournament is the Buy In + the Operators Fee. To enter the Tournament click on the enter or register button in the Tournament lobby, you will get a message to confirm that you have entered the Tournament and your name will appear in the list of registered players. If you make a mistake then don’t panic, normally you are allowed to withdraw from the Tournament up until a certain time before the Tournament starts (usually 1 minute). So just click on the withdraw or de-register button and your buy in will be returned to you. In the Tournament lobby window you will find a summarised version of the Tournament structure. There will also be a link or button to press to access the full details of the structure. For a short tutorial in navigating the Tournament Lobby at an example online poker site 888poker click play on the following video. Before you start a Tournament you should ensure you understand the following two important elements of a Tournament Structure. The starting stack is the amount of Tournament chips that you receive in exchange for paying your buy in. A higher starting stack means that you have more time to play and don’t need to rush. Similarly a lower starting stack in relation to the blinds can mean that you don’t have a lot of time to wait around for really good hands and you may have to “gamble” a bit more with lower quality hands. The Blind levels structure will tell you the starting blind values and the clock or timing for each level which will tell you how long each blind level will last before it is increased to the next level. A faster and steeper blind level structure will lead to a shorter Tournament but will mean you have less time to wait around for good hands and it becomes increasingly urgent to build your stack to be able to afford the rapidly increasing cost of the blinds and bets. The Tournament structure will also give you other relevant information such as the times of the breaks (usually there will be a 5-10 minute break every hour) and the prize award structure. You have now selected and entered the Tournament. All that is left now is to wait until the start time for the Tournament. As long as you have your online poker software running then you will automatically be allocated and table when the Tournament starts and the window with that table will pop up ready for you to start playing. During the Tournament players will inevitably get knocked out and as numbers at each table get reduced due to knocked out players then players will be periodically moved to new tables to ensure that an even number of players are playing at each table. As player numbers reduce tables will be merged with others and the number of tables will slowly reduce until we reach the Final Table. At your table you will play the chosen poker game as normal with the only difference being the blinds will periodically increase as per the Tournament Structure. You will need to ensure you are keeping track of the blinds as this will determine just how long you have available to sit and wait for good hands. As the blinds get to be a larger proportion of your stack then you will have no other option but to start to play with lower quality hands. A good way to gauge your progress in the Tournament is the Average Stack. The Average Stack is calculated by dividing the total chips in play in a Tournament by the number of players that are remaining. Total Chips in play can be calculated by multiplying the number of players who entered the Tournament by the starting stack. As players are eliminated the average stack value will increase and you will be able to compare this to your stack to gauge how you are performing in the Tournament. A higher than average stack means you are doing well in the Tournament and a lower then average stack means that you may be at risk of the increasing blinds becoming too expensive for you soon and it may be time for you to start to gamble. 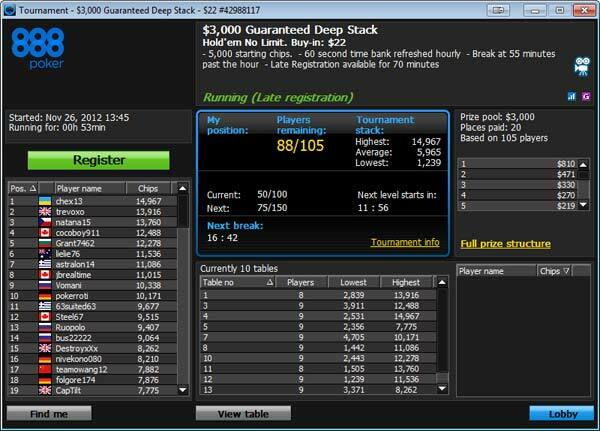 The average stack calculation is normally done for you by the online poker software and displayed in the Tournament Lobby. The prize pool will be awarded to players based on the payout structure for the Tournament. The payout structure will vary widely depending on the number of players entered in the Tournament but as a guide normally the top finishing 10% of players will be awarded a prize in increasing amounts with the 1st place finisher taking home the largest prize. Your first aim in any Tournament is to finish “In the Money” so an important figure for you to know will be how many players are paid and therefore what is the minimum position you need to finish in order to win some prize money. The “Bubble” is a popular term in poker and it means the final player who finished a Tournament without winning any prize money. This unlucky player is said to have finished “on the bubble”. Once that final player is eliminated then the “Money Bubble bursts” and all other players left in the Tournament have won prize money. You will often find that players are reluctant to play when close to the bubble as no one wants to finish on the bubble and everyone wants to make it into the money. So The money Bubble is the first key milestone in a poker Tournament. If you have made it this far then congratulations, you have achieved your first goal and won some prize money. Now your aim becomes to finish as high up the leaderboard as possible and to make it to the final table. Eventually a Tournament will be left with the final 9 or 10 players and will be down just one single table. If you have made it this far then congratulations because you should already have won some nice prize money that far exceeds your original buy in. But your work is not yet done, because payout structures in a Tournament are usually top heavy and you will receive a much higher % of the prize pool by finishing in the top 3 players or so. The Tournament will continue until we are down to the last two players at which point those two players will battle it out for the Tournament victory. This is referred to in poker terms as “Heads Up”. The Tournament will conclude when one player has won all the chips in the Tournament and that player will be awarded the first place prize money which will be a very nice pay day indeed. Occasionally in Tournaments the remaining players will agree a “deal” to split the remaining prize money between them. This usually only happens in larger Tournaments and is not always available on some online poker software. The purpose is to more evenly split the remaining prize money between the players remaining. This is in contrast to the top heavy payout structure that normally awards much higher percentages to the top 3 finishers. You don’t really need to worry about this as it is very rare, but you should just be aware that it happens on occasion. So that is the 5 basic steps of how to play a Poker Tournament. It is a really fun format to play poker and adds a real strategic and competitive element to the game. We have only covered the basics here of how to play Tournament Poker. Becoming good at playing Tournaments and consistently winning is a much more in depth subject, but if you decide that you enjoy poker Tournaments and that is the route you want to take then the subject of good Tournament strategy is an enjoyable one, especially when you start to see the rewards and increased prize money from it. Why not try our How to Win a Poker Tournament Guide in our Poker Tips Section. Its a complete guide that will discuss and explain Tournament strategy with you at various stages of the Tournament with the aim of making you a more profitable Tournament poker player.